These are the short films nominated this year for the Animated Short Film category. We’ll get to see the winner announced a week from today, but after viewing all of them last night, I have two favorites and not a single prediction. 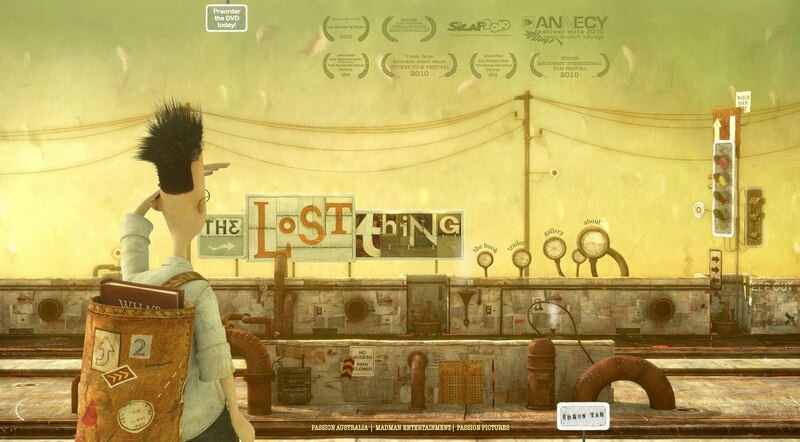 Here is the trailer for Australian film The Lost Thing. With its future-wasteland, Steampunk animation, it definitely gives a bleak view of where we’re headed. When the main character finds “the lost thing” and eventually leads it to where it can coexist with other special objects, we get a sense of a world where there is still some magic left. But the end of the film, where the narrator tells us he doesn’t see any lost objects or at least doesn’t take the time to notice them anymore, is where the message lies. It seems to be a comment on keeping the magic and innocence of childhood, of remembering how special something different can be. We’re told to appreciate the unusual and not get lost in the drab day-to-day. Even despite the relevant message, the gorgeous, intricate animation is what endeared me to this film. And here we have the first 30 seconds of my other favorite, The Gruffalo. With a German animation team and a host of celebrated British voices (including Helena Bonham Carter, Robbie Coltrane, Tom Wilkinson, and John Hurt), this classic story was originally shown on the BBC. Simply put, this film charmed me. It possesses the same timelessness as stories like the Tortoise and the Hare, the Boy Who Cried Wolf, and many other Aesop’s Fables we remember from childhood. It’s also the longest film nominated in this category at 27 minutes. I chose these films for their beautiful animation and subtle messages. The Madagascar Travel Diary was also beautifully animated, with a mix of watercolors, pastels, and sketches so real you could see eraser marks and creases in the paper. Let’s Pollute hit you over the head with its sarcastic message and overly-simple animation – just not as impressive as its fellow nominees. Pixar’s Day and Night is cute and definitely an interesting idea, but the animation doesn’t have the same special quality as my two favorites. Though much more opinion than analysis, there’s my Academy Award Animated Shorts Round-up! You can find another round-up with summaries and clips on IndieWire.